Im in my 25th week now. The doctor moved my due date up to April 28th. The baby that was always a week behind had a growth spurt and is now only an ounce or two smaller! Yea, Im so proud of the little guy! 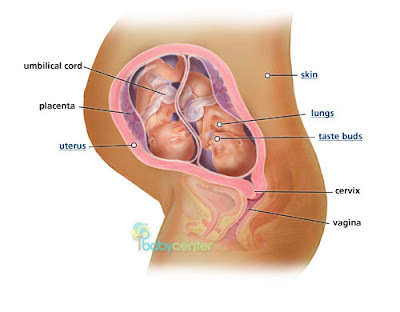 Here is what baby center thinks they look like@ 24wks. We have almost finalized our names, thinking more and more about baby showers, strollers and changing tables and such. Im getting a little anxious about getting everything that we will need, and its hard to know what we will need two of. I'm looking for a cheep or free dresser that could be used as a changing table, so preferably solid wood, and wide enough to put one of those changing things on top of. So, if you see one or hear of one, let me know. Even if it is uggo, I can paint it. We start our birthing class tonight, we are excited about that. Katy and Clay are in our class, too. Hi, I don't think you know me, but I go to SGC too. Regarding the dresser, you should put a want ad in the church classifieds (if you havent already). Hope you continue to have a good pregnancy!